This went down quite when I published it over at the Myspace Art Association the other day - so here it is again. 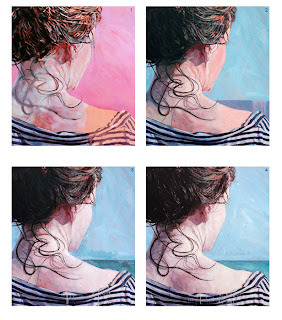 It shows the first four stages before the final painting (shown as part of my first post last December). In other news - nothing happened. For those living outside the UK, be warned that this country seems to suffer a collective post Christmas hibernation. Having built up my red wine reserves over the festive period (much respect to those who gifted alcohol this year - I feel the love! ), I made a nest on the sofa and have slowly been burning through the stockpile. February beckons though - and I'm sure to emerge blinking into the light like a bear with a sore head - stumbling around the Tescos wine aisle looking to replenish spent nutriment. I'll be flipping bottles from the shelves like a grizzly plucking salmon from a river.... "Grrrrrr" (coughs). Hi, I ran into ur site while searchin 4 a friends site. Well liked ur blog. Quite a good reflection of wat Jan is like in the UK. If u can throw out some more stuff like that, it be CRANKIN'!! !